The Dakota Voyager UTP with Serial enables you to extend the keyboard, monitor, mouse and serial device up to 1,000ft on a single CAT 5 cable, without the loss of signal. Perfect for banks, trading rooms, exhibitions and other mission critical locations. Allows you to move your computers to remote security rooms, server racks or simply away from the action. The Voyager extender is compact yet powerful. 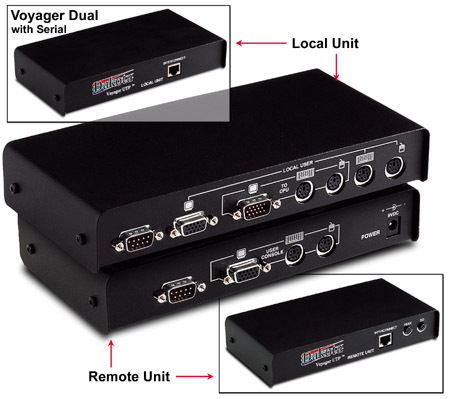 Both the transmitter and receiver are constructed of steel and come with the appropriate cables to allow you to plug the Voyager UTP into the computer and your keyboard, monitor and mouse. Since the extension between the transmitter and receiver utilizes standard structured cable (Cat. 5 UTP), inexpensive or previously installed cables can be used, reducing installation costs dramatically.